Based fuel have kept the production of chemicals mainly confined to producing ethanol from corn sugar - until now. The production of chemicals by fermenting various sugars is a well-accepted science. Its use ranges from producing beverage alcohol and fuel-ethanol to making citric acid and xantham gum for food uses. However, the high price of sugar and the relatively low cost of competing petroleum-based fuel have kept the production of chemicals mainly confined to producing ethanol from corn sugar – until now. The Company has developed significant proprietary improvements to a well-known conversion technology known as Concentrated Acid Hydrolysis such that the process is ready for commercial implementation. 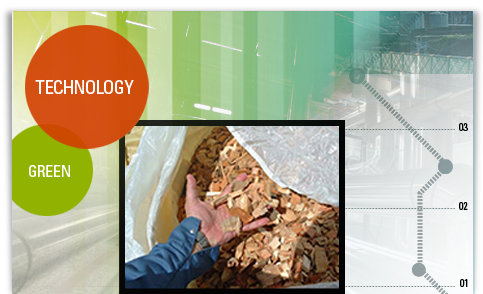 The Technology is unique in that, for the first time, it enables widely available cellulosic materials, or more commonly, biomass, to be converted into sugar in an economically viable manner, thereby providing an inexpensive raw material for fermentation or chemical conversion into any of a hundred different specialty and/or commodity chemicals. wood wastes (prunings, wood chips, sawdust, etc. ), and green wastes (leaves, grass clippings, vegetable and fruit wastes, etc.). The ability to utilize low cost feedstock, and/or those that command tipping fees, to produce products that sell into highly efficient markets provides a viable business that can be sited in almost any geographic area, urban or rural. Due to its moderate use of thermal energy, the production of minimal waste streams, its significant environmental benefits, and minimal permitting requirements, the Technology also makes an ideal “thermal host” for cogeneration facilities. Development History – It has been known for over 100 years that acids act as catalyst to convert (“hydrolyze”) cellulose and hemicellulose into simple sugars (hexose and pentose, or “C6 and C5” sugars). The Germans and Russians used this simple procedure in the early part of this century to produce alcohol fuels and chemicals from wood in order to supply their war efforts. During this same period, a similar plant was operated in the United States in Oregon. However they all shared a similar characteristic – they were not economically competitive with low cost petroleum products because of poor yields, high wastage, and the large volume of unmarketable by-products. Except for a few plants in Russia, the technology fell out of use after World War II. BlueFire is currently in the process of developing two cellulosic ethanol facilities in Lancaster, California and Fulton, Mississippi. The fully-permitted and shovel-ready Lancaster facility, BlueFire’s first U.S. commercial plant, will use post-sorted cellulosic wastes diverted from Southern California’s landfills to produce approximately 3.9 million gallons of fuel-grade ethanol per year. BlueFire is in the detailed engineering phase for its second commercial plant in Fulton, MS, which will produce approximately 19 million gallons of ethanol per year from woody biomass, mill residue, and other cellulosic waste. These two planned facilities will create more than 1,000 construction jobs and, once in operation, more than 100 new operations and maintenance jobs. This is in addition to the hundreds of jobs created or maintained at equipment vendors and suppliers that will be involved in the company’s other projects. BlueFire Renewables recently announced that the Department of Energy has determined that BlueFire has met the requirements necessary for Phase I completion of the application process for its Loan Guarantee and that the company has been invited to continue on to Phase II for the financing of their Fulton, MS Project. 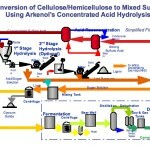 To demonstrate the efficacy of the technology Arkenol constructed and operated a pilot plant near its Southern California offices for roughly five years. Since 2003, the technology has been successfully used by an unrelated, independent, and internationally recognized corporation to produce ethanol for the Japanese transportation fuel market. Over the last 10 years, the initial testing on a vast array of potential feedstock has been completed both in the U.S. and at various locations throughout the world. The core technology and other related processes are protected under patents issued and pending by the U.S. Patent and Trademark Office. 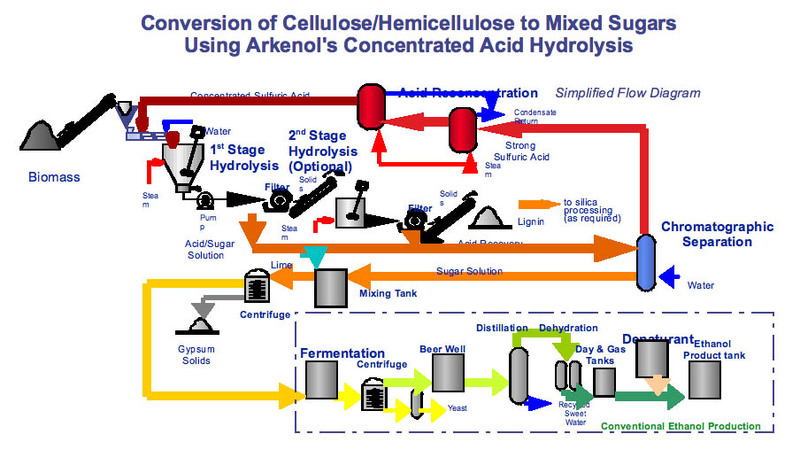 Simply put, the process separates the biomass into its main constituents: cellulose and hemicellulose (the main building blocks of plant life) and lignin (the “glue” that holds the building blocks together), then converts the cellulose and hemicellulose to sugars, ferments them and purifies the fermentation liquids into products. These unit operations require a series of material and energy inputs to produce the primary products of fermentation and the resultant by-products. The remaining acid-sugar solution is separated into its acid and sugar components by means of chromatographic separation. BlueFire uses commercially available ion exchange resins to separate the components without diluting the sugar. The separated sulfuric acid is re-circulated and re-concentrated to the level required by the decrystallization and hydrolysis steps. The small quantity of acid left in the sugar solution is neutralized with lime to make hydrated gypsum, CaSO4 · 2H2O, an insoluble precipitate which is readily separated from the sugar solution and which also has beneficial use as an agricultural soil conditioner. At this point the process has produced a clean stream of mixed sugars (both C6 and C5) for fermentation. In an ethanol production plant, naturally-occurring yeast, has been specifically cultured by a proprietary method to ferment the mixed sugar stream, is mixed with nutrients and added to the sugar solution where it efficiently converts sugars to fermentation beer (an ethanol, yeast and water mixture) and carbon dioxide. The yeast culture is separated from the fermentation beer by a centrifuge and returned to the fermentation tanks for reuse. Ethanol is separated from the now clear fermentation beer by conventional distillation technology, dehydrated to 200 proof with conventional molecular sieve technology, and denatured with unleaded gasoline to produce the final fuel-grade ethanol product. The still bottoms containing principally water and unfermented pentose sugar is returned to the process for economic water use and for further conversion of the pentose sugars.